Hybrid Cloud Gateway 2 2GB The Hybrid Cloud Gateway (HCG) maintains a secure channel between a vCenter and a vCloud Air Dedicated Cloud. The channel secures access for vSphere protocols that are not tenant-aware, and provides intelligent routing capabilities to avoid networking "middle mile" problems. Layer 2 Concentrator (optional) 1 512MB The Network Extension Service extends a Layer 2 (L2) network extension from a vCenter with a vSphere Distributed Switch (vDS) to a Dedicated Cloud. 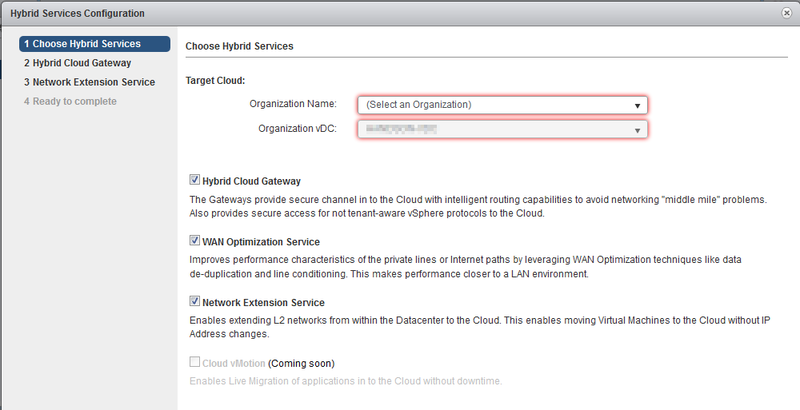 WAN Optimizer (optional) 8 14GB The WAN optimizer, if installed, communicates only with the Hybrid Cloud Gateway. It uses software-defined WAN optimization techniques such as data deduplication and line conditioning to improve the performance for any workload passing through the Hybrid Cloud Gateway.